Our services include deposits, loans, foreign exchange, trade finance, and domestic/foreign remittances. We have long and close relationships with the state investment promotion corporations of all East German states. We help our customers meet their needs with their investments. We offer alternative financing methods by liquidating trade receivables. In addition to an individual buyer scheme, we also offer various risk hedging schemes for a diversified receivables pool. Backed by our vast experience, expertise, knowledge, and global network, we provide professional services in arranging limited-recourse finance and financial advisory in various sectors, including natural resources, power, and infrastructure. Since 2010, we are able to offer KfW Bankengruppe loans as an alternative financing instrument. Our customers can benefit from various KfW loan programmes to meet their needs. German ECA (Hermes Cover). Hermes Cover, a common name for the German ECA (Export Credit Agency), is an export credit guarantee by the German government, which protects corporations in Germany from payment defaults of foreign debtors. In order to support the export businesses of our customers, we can provide importers with a loan (Buyer's Credit). By proposing the financing package to importers, exporters can differentiate themselves from other competitors during negotiations on export contracts. Our experienced staff can advise you on various hedging methods against currency and interest risks. Cash Management Service. Besides providing account information and receiving payment instruction on a real-time basis, we can provide you with cash pooling proposals within your group companies or advise you about the efficient use of funds. MUFG has a proud history that has continued to grow with our customers for over 50 years in D�Eseldorf, since the establishment of our first branch in 1957. Effective Apr 2018, the branch was transferred under MUFG Bank (Europe) N.V.
MUFG has the largest network in Germany among Japanese banks and operates in five cities. 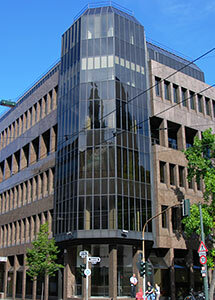 D�Eseldorf is our main office in the country and has a staff of 200. Germany is one of the major economic powers leading the world economy, which is why many Japanese companies have a presence in Germany, especially in D�Eseldorf. We provide an array of financial products and services that support the business of both Japanese and non-Japanese companies.